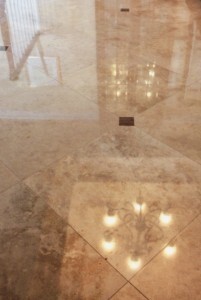 We went to Huntington Beach for this travertine cleaning & polishing job. Call (800) 408-2254 and we can make your travertine shine as well. While it is important to apply a final sealer to all newly installed or restored stone it is imperative in the case of cleaning travertine because of of its soft and porous nature. It is also important to know what cleaning procedures were performed before the sealer is applied. Following the detail cleaning it is vital to make sure that the surface is pH neutral after a rinsing process. This will ensure that there are no impurities in the travertine and that the sealer will bond to and protect the stone much better. Obviously, the type of sealer used and the application process itself is also very important. We will never use water-based sealers on natural stone although they are the least expensive and easiest to work with, they often underperform. We use only premium solvent-based sealers on all natural stone. We make sure not to over-apply, because any sealer remaining on the surface after 3 – 5 minutes can become blotchy. 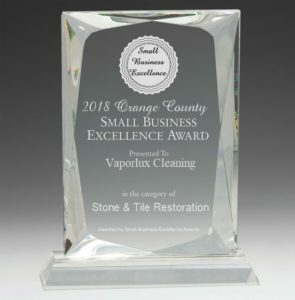 A complete “rub down” with microfiber cloths will finalize the process. If you have a travertine floor that needs expert cleaning or sealing contact Vaporlux Cleaning at 714.330.0973 for a free quote. Back to main Travertine Cleaning page.